Will Oil ‘Gush’ from Unauthorised Exploratory borehole under High Weald? The Times My feeling is that unless there was a condition on the original permission preventing sidetracks then Surrey CC dont have a leg to stand on, they can simply claim they were drilling for oil – the purpose of their original consent. An oil company has drilled a well in the green belt without permission and ignored repeated warnings that it would need consent, a council has said. Angus Energy continued to drill at Brockham, Surrey, in January despite the county council writing to the company twice to say that it required planning approval. Residents are calling on the council and the Environment Agency to hold an inquiry and to prosecute the company if it has broken the law. 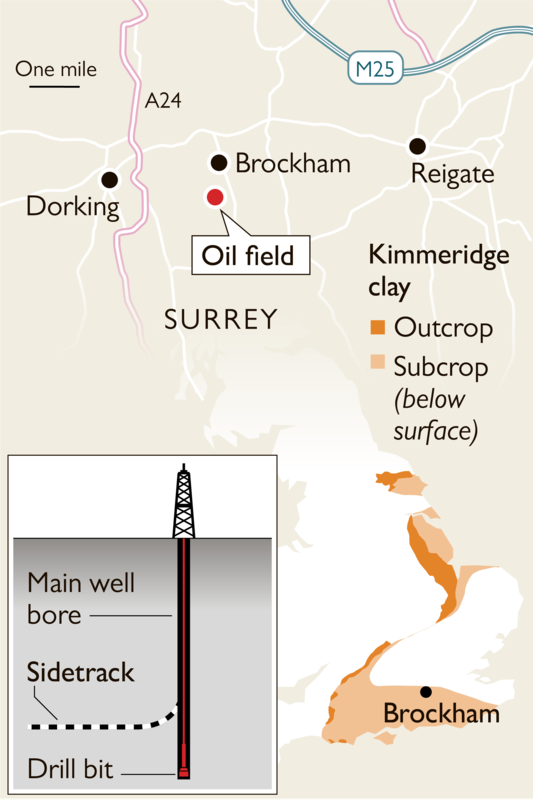 Angus has an existing oil production site at Brockham, near Dorking, but had been told that its planning permission did not cover any new drilling. The company believes there could be far greater quantities of untapped oil 700 metres underground in the Kimmeridge layer of shale that runs across the Weald. Surrey county council said that it was “extremely disappointed to find out that Angus Energy has acted without planning permission and contrary to our advice and guidance”. The council sent letters to the company in September and December last year stating that it would need to apply for planning permission to drill a new sidetrack, which is a well branching off the original borehole. Clayton Wellman, a Liberal Democrat councillor in Mole Valley, the district covering Brockham, said he was very concerned because Angus Energy also had a stake in the most controversial new oil exploration site in southern England, near Leith Hill in the Surrey Hills Area of Outstanding Natural Beauty. “We are very worried because we do not know what else they are doing and whether they are doing things properly,” Mr Wellman said. Roger Abbott, who lives less than a mile from the Brockham site, said that Angus Energy had told the local population that it was only exploring existing wells. He called on the county council and the Environment Agency to hold an inquiry “to assess whether Angus Energy can be trusted with the high-risk business of extracting oil from within the green belt” and to prosecute the company if it had broken the law. “The well should be shut down immediately pending that inquiry,” he said. Keith Taylor, the Green MEP for the South East of England, said that “the drilling, without permission, of a new well is an outrageous breach of an already deeply strained trust” in the oil and gas drilling industry. The council has suggested that Angus Energy could apply for retrospective planning permission. The Oil and Gas Authority, the government body which regulates the industry, said that it was looking into the concerns raised.